SEEKING THE CURRENT | A documentary about green energy and the large hydroelectric project on the Romaine river. Follow this link to order online and get your copy of the Home Version DVD delivered to your home. Follow on this page the news about the film’s tour in New Hampshire, USA from march 8 to 16 2012. The co-director Nicolas Boisclair will meet the public before or after the film in most screenings and will probably post some impressions and pictures about the tour. Let’s remind that New Hampshire is one of the biggest proposed exportation zone for the Romaine Electricity since Hydro-Quebec wants to export through New Hampshire via the controversial proposed power line called the Northern Pass. 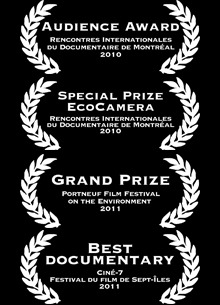 The film had 6 screenings in french in february 2012 in France at the Paris environmental film festival and it was a nice success. Just wondering when the English version of the DVD will be available, or “if” it will be. We will be putting it up for sale via PayPal next week. The link will be on the website. I had the moving experience of viewing the film Seeking the Current in Wolfeboro this week. The strong images continue to replay in my mind. The concept of paddling the Romaine River, from its trickling head waters to the Grand Falls at its mouth, prior to the river being forever changed by a series of Hydro-Quebec dams, is brilliant. A group of young environmentalists spend 44 days paddling the river and sharing provocative questions about the impact of altering its course. Clear statistics of investing in sustainable energy alternatives are interwoven with the wild scenery of the excursion. This film is thoughtfully done, and powerful. Thank you for bringing it to New Hampshire! Thank you! We loved your screening in Colebrook, New Hampshire and appreciate very much Nicolas Boisclair’s introduction of the film and his excellent handling of the questions that followed the viewing. We have so much in common on both sides of the border and we are connected. Our regional energy policies must be informed by films like yours. 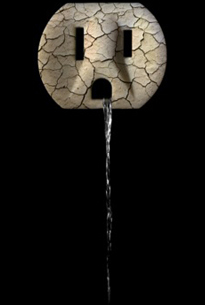 The alternatives to big hydro and ecosystem destruction are cogently portrayed. Bravo!! The English DVD link to purchase is not longer working?? Does this mean it is not available any more? ?